The Ryzen 5 2500U’s mobile performance is comparable to the Intel Core i5-8250U, with the integrated graphics processor efficiency nearly twice as high. 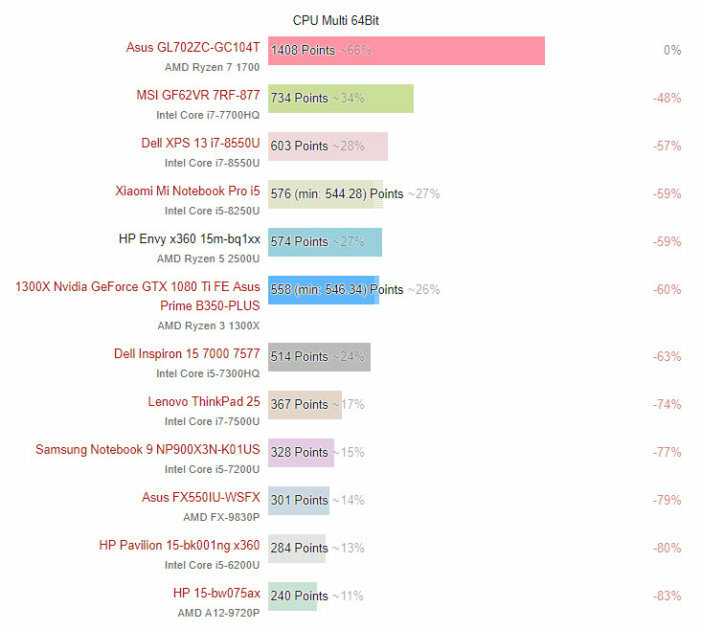 Ryzen’s first mobile test results were published by Notebookcheck.net testing the HP Envy x360 15 notebook, which has a computing heart is AMD Ryzen 5 2500U. The new mobile Rizen has also been tested for potential performance degradation over long periods of time, especially while performing demanding tasks. The intensive calculations test in CineBench R15 showed no significant degradation in its performance. Thus, we can say that the new AMD processor is a well thought out design that could change the long absence of AMD processors in laptops. Ryzen 5 is a mid-range processor. 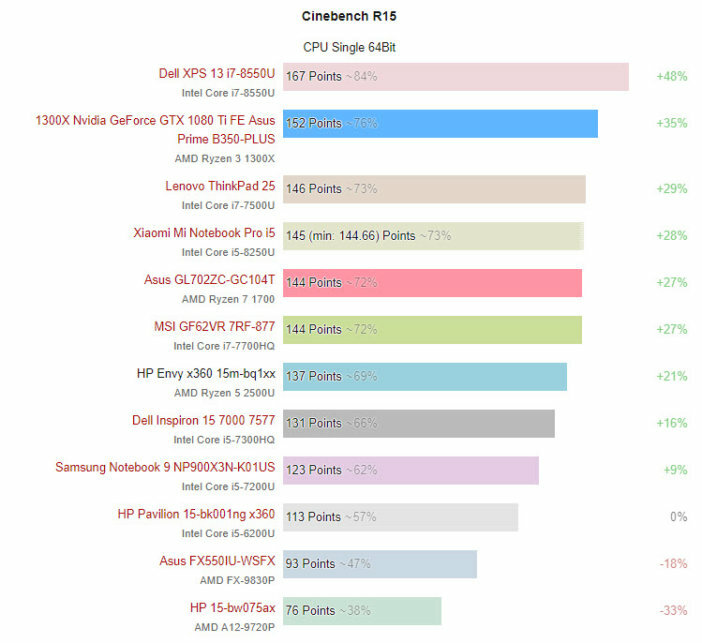 The results in the Cinebench R15 show that this new mobile AMD system should do well on the market. HP’s Ryzen 5 proved to be better than a Dell notebook with an Intel Core i5-7300HQ, and slightly weaker than its predecessor, the MSI with the Intel Core i7-7700HQ. The results of the mobile Ryzen 5 are comparable to the Intel Core i5-8250U. The results of the tests show that this mobile chip can do good in stores. The HP Envy with Ryzen 5 beats easily mid-range gaming laptops based on the popular Intel Core i5-7300HQ. Interestingly, the new Ryzen is characterized by a noticeably lower appetite for energy. Let’s look at the next table. Mobile Ryzen 5 2500U is not only fast (in its class), but also can save energy. It is clear that AMD is also able to build a mobile chip that is a good compromise between energy consumption and performance. 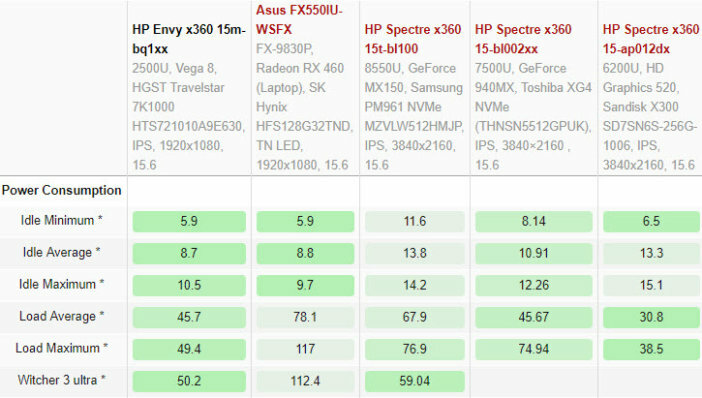 Even in the most burdensome gaming systems such as the Witcher 3, the HP Envy laptop with Ryzen 5 2500U took about 50 watts, and in the case of low load, it reached only 10.5 watts. This is a very good result. The results in 3DMark 11 (for the GPU) show that the built-in Ryzena Vega 8 can beat with no problem Intel U HD Graphics chips. When we take into account the results achieved by Ryzen’s integrated graphics module (Vega 8), it turns out that we have a really good candidate for the chart-topping mid-range gaming laptop. AMD GPU performance is significantly faster than Intel graphics, and it also wins the NVIDIA Geforce 940MX. In conclusion, the Ryzen 5 mobile test looks more than promising. The time will tell if these results will lead to more demand for AMD’s incorporated gaming laptops. The potential is here, the question is, will manufacturers be convinced that the new chips are efficient enough to introduce them to the market and which models should they be integrated into. This may be a game changer for AMD, that has had a problem with supplying notebooks with their own processors. 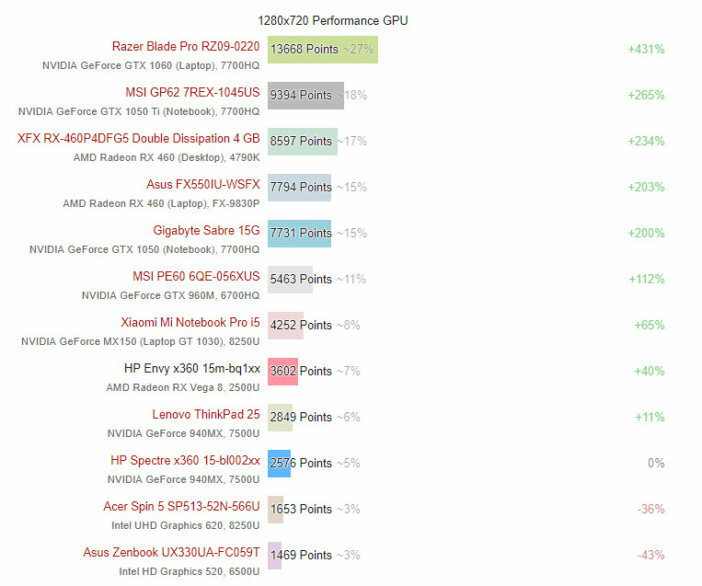 This entry was posted in General Reviews, IT, IT Reviews and tagged 3DMark 11, AMD, computer, computing, CPU, game, gamer, gaming, gaming notebooks, geek, graphics, HP Envy x360 15, information, innovation, Intel Core i5-7300HQ, news, notebooks, Ryzen, Ryzen 5, tech, technology, techy, test, trends, U HD Graphics chips, video. Bookmark the permalink. I heard that AMD faster than Intel, is that true ? AMD and Intel they’re both doing drastically different things with their processors. Intel has kept its focus on higher clock speeds and lower core counts while AMD has doubled down on what it knows by integrating insane numbers of cores in its processors at acceptable frequencies. AMD is building up quite the savings account with its Ryzen-branded processors, namely the ‘high-performance’ chips gamers enjoy such as those featured in the Threadripper series. Meanwhile, Intel is experiencing a wealth of growth except in the desktop processor category, indicating some sure-fire competitive progress from AMD. That said, it isn’t far-fetched to say AMD and Intel can cater to different audiences side-by-side with some overlap in between. Intel is a bit faster though. If you’re a gamer AMD will be perfect for you. Another interesting thing, Intel and AMD recently joined forces and they will launch Intel CPU AMD Graphiscs integrated devices. Intel CPU AMD Graphiscs ?